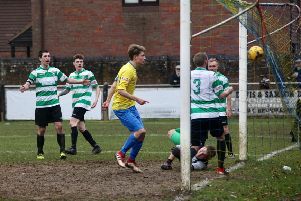 Title hopefuls Tring Athletic strengthened their position at the summit of the SSML Premier Division with a 3-2 derby day win at Leighton Town on Saturday. With none of their nearest rivals playing that day, Tring’s victory was able to extend their lead at the top to three points with only seven games to go, albeit some tough ones. 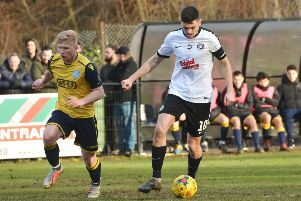 Second-placed Hadley are three points adrift having played the same number of games, while third-ranked Biggleswade FC are six points behind but with three games in hand. Athletic continued their winning ways on Saturday against an in-form Leighton side, who had only lost one of their last ten games. Impressive finishing from striker Ashton Campbell, with a brace, and George Ironton netting early in the second-half saw Athletic deservedly take all three points. With a strong, swirling wind and a bumpy pitch, the conditions were always going to be difficult for both sides. Athletic scored the opener after 10 minutes when a through ball from Ironton found Campbell, who rounded the Town keeper before firing into the far corner. Town equalised against the run of play after 36 minutes. A long throw-in came in and the ball was flicked on at the near post across goal by a Town player before finding Ross Adams, who finished clinically. Athletic probably felt disappointed having created numerous chances but in first-half stoppage time they fought back to re-take the lead. A Tring free-kick was played in and home keeper Charlie Jones punched it clear, but only to Ironton, who found Mark Riddick. He headed across goal to Campbell to volley home. Just four minutes after the break Athletic made it 3-1. Roy Byron patiently held the ball up just outside the Town area before laying the ball back to Ironton, who unleashed a shot which flew into the far corner. Athletic contained the home side fairly comfortably until Town were given a lifeline in the 68th minute. A long ball was played towards Athletic’s goal, with striker Adams and defender Joe Fitzgerald both running for the ball, which looked to be going wide of goal, but a tackle came in from the defender which was adjudged to be a penalty. Town’s Jordan Fredericks dispatched the spot-kick to make it 3-2 despite the efforts of keeper Patrick Sinfield, who nearly made a great save. However, Athletic were able to see out the final 20 minutes to secure the crucial three points. This Saturday Tring host seventh-placed Arlesey Town.